There are always compromises when you’re considering a recreational vehicle, but if a fixed French bed is high on your list, this little beauty is ready to go. My first impression of the new Swift Voyager 664 was that this was a vehicle designed with quick getaways in mind. Not only is it compact – coming in at less than seven metres in length – it’s also packing a permanent bed among the many features on offer. I felt as if this was a vehicle where I could quickly stow the necessities and steal away to some glorious retreat without a backward glance. And the thought of a ready-bed after all those road miles under my belt has a great deal of appeal. Naturally, these are first thoughts but a deeper assessment of the vehicle turned up a host of other features that simply reinforced my impression that this is a great little roadster for two – or more if desired. In addition to the aforementioned permanent French bed, measuring in at 1.85m x 1.25m, the lounge converts to a second double berth of 2.08m x 1.24m. Both beds are tapering. The rear bed, with Swift’s trademark Duvalay Duvalite Comfort Mattress (with memory foam), has a cutaway for easy access. The second bed converts from the lounge and, as you would expect from this tried and true manufacturer, it’s been made easy with drop-down table and slotted frame pull out assembly. The French bed is adjacent to the bathroom, the design of which has seen a recent upgrade to include water efficient Ecocamel Orbit showerhead which mixes air with water. This comes with an on/off switch so it’s up to you to choose how you use it. Unusually, the shower is central in this bathroom set-up and the cubicle can be curtained off. It seems to make sense, although I admit this review was not a road test so I cannot confirm this opinion. Hot water and heating are courtesy of the trusted Truma Combi 4 that is operated by both gas and electrics. Thanks to Truma’s Mono regulator it can be used en route. Those unfamiliar with this option would benefit from paying close attention to the previously mentioned feature. This means that there’s no getting to the snow – or surf – and suddenly trying to quickly get a cosy on. The cosy is already on, if you choose it to be. And take it from one who has previously experienced this winter comforter, you will appreciate this function. It’s these small details – like the Grade Three insulation, the Truma heater and the double-glazed windows – that can set a great vehicle apart from a good one. And my initial impression of the Swift Voyager 664 being road-ready is reinforced. I’m no snow bunny, but I do like my creature comforts, so this Truma combination gets big thumbs up from me. So, let’s imagine for a moment that you’ve arrived at your destination, swivelled those cab seats and climbed into the comfortable living area to relax. The dinette table has been deployed from its driving position under the fixed bed, and you’re now setting up the table for up to six people. The Swift 664 is – as you’ll remember – a four berth with seatbelts for up to four passengers, but the dinette is capable of seating a couple of extras at mealtime. And there’s a TV mounted on the wall behind the driver’s seat if you want to catch up on the news while you’re preparing the meal. The TV can also be shifted to the bedroom area for evening viewing if this more suited. The galley set up is conventional. It’s cosy, and – as always – a compromise is needed when choosing the essential features for the motorhome of your choice. Write up a wish-list to work out what you value most, but in my experience, when it comes to galley design, you’re always going to have to be organised and get used to cooking in a confined space. As expected, the Swift Voyager doesn’t shatter this illusion, but I could see that the manufacturer has tried to maximise the bench space by providing a reasonable sized preparation space beside the sink that, like the hob, also has a cover. Overall this is well-designed space with plenty of overhead storage, plus cupboards and drawers. It’s fitted with a three burner, hob, oven with grill, plus a microwave and under-bench fridge/freezer. Storage throughout the vehicle is well thought out. The fixed bed provides a great opportunity for under-bed storage, which has been best utilised by the manufacturer with the provision of access from the inside as well as the outside of the vehicle. There’s a handy shelf above the driver cab for stashing all those things you need on hand when touring, as well as loads of locker space throughout. This is a low-profile vehicle with easy access as well as a handy step for people like me who might be a little short in the leg department. The new aerodynamically low profile means you not only get a sleeker looking vehicle, you’ll also enjoy a nippier ride. Under the bonnet is the ubiquitous Fiat Ducato 97kW turbo-diesel mated to a six-speed automatic transmission that is guaranteed to gobble up the miles. There are numerous other features worth mentioning like the reversing camera, external shower and barbecue points, numerous overhead vents and hatches, tank monitors and carbon monoxide and gas alarms that come as standard. If you buy this vehicle from Merit RV, you’ll also receive a number of valuable extras added in especially for the local market; like an awning, solar panel, LED-TV with Freeview and automatic satellite dish, a house battery plus two gas bottles and a factory-installed bike rack. Of course, my earlier assertion that the Swift Voyager 664 is road-ready is especially true in this case because Merit RV will have gas and electrical certification to local standards done and dusted, and they’ll ensure the vehicle is self-contained with an NZMCA self-containment certificate. You’ll also drive away with 12 months’ registration, 3000 kilometres of RUC plus the assurance of a five-year Fiat warranty, a six–year body warranty and three-year internal warranty. I think this is where we came in, but my feeling is that the Swift Voyager 664 is road-ready. Grab your gear and get going. 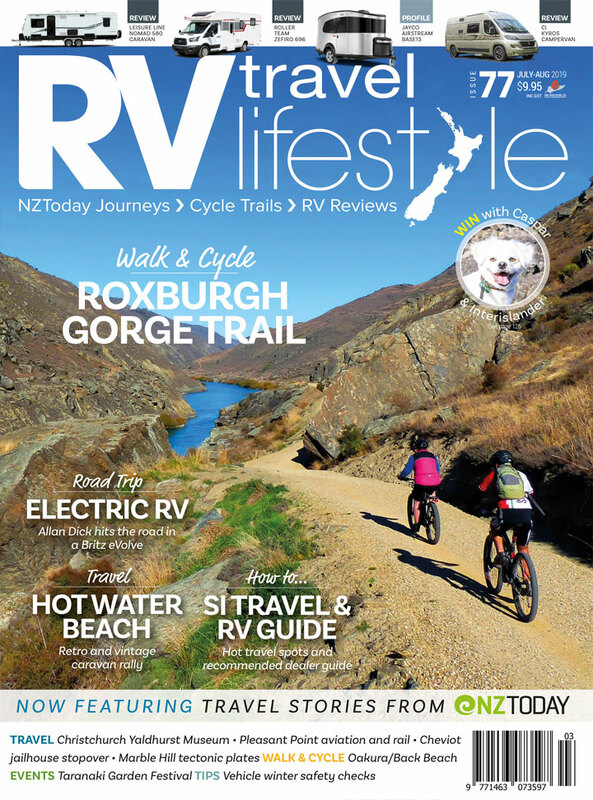 Monitored tanks, reversing camera, carbon monoxide and smoke alarms, external barbecue and shower points, solar panel, LED-TV with DVD and Freeview, house battery, 2 x gas bottles, automatic satellite dish, awning, electrical WOF, gas certification, NZMCA Self-Containment Certificate, 12-months registration, 3000km RUC, 5 -year Fiat, 6-year body, and 3-year internal warranty on the motorhome. No extra on-road costs.